In January 2012, twelve girls at LeRoy Junior-Senior High School presented with an illness that made them twitch and shout in a manner similar to Tourette Syndrome. After numerous tests to rule out environmental contaminates in the school and other possible diseases or feigning, doctors diagnosed that the girls were suffering from conversion disorder, the clinical name for mass hysteria, a very rare disorder that is caused by the brain but can have very real and frightening symptoms. This case has been likened to the Dancing Plagues of Alsace, an area now known as the southern plains of France and Germany. The best-documented case of the Dancing form of mass hysteria occurred in 1518 A.D. in the town of Strasbourg, Germany. Strasbourg was a large city located on the Rhine river. It was also known by its Roman name, Argentina, so-called for the silver mines in the area. After the invention of the moveable type press in the city of Mainz, Strasbourg became the center of the printing revolution and had a thriving printing industry. 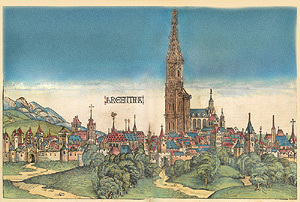 Strausberg was famous throughout central Europe in the 15th century for Our Lady of Strasbourg Cathedral, the world's tallest building at the time. It also housed the world's largest astronomical clock. Most importantly it was home to Johann Geiler von Kayserberg, considered to be the greatest of all popular preachers in Europe.He was able to attract huge crowds to fill the cathedral in a time before television, radio, or newspapers. Every week independent scribes wrote down his sermons as he spoke and sold them to the printers of Strasbourg who sold copies to the tens of thousands of pilgrims flocking to hear his fiery sermons. Strausbourg was in many ways the Silicon Valley of its day because it made an industry of taking popular culture, current events, and entertainment and putting it into a form that could be easily shared. This conjunction of influences led to the establishment of the world's first newspaper in 1605. So when people began to dance to their deaths in this major city on the Rhine the story quickly spread. Doctors, legal experts, political leaders, clerics, and scholars from all over came to witness and chronicle the phenomenon. Even Paracelsus wrote about the dancing plague and diagnosed it as "choreomania," or dancing madness. There were many eyewitness accounts printed that were widely circulated, many are still in existence, giving scholars a very clear pictures of the Strasbourg Dancing Plague. On a warm day in July, 1518, Frau Troffea began to dance feverishly in the street. No one knows why but many speculated she danced to get away from her husband or to get out of her chores. She danced up and down the streets leaping and gesticulating all day, drawing a crowd. When she fell in exhaustion they thought that the spectacle was over, but, as soon as she woke she began dancing again. This continued for four to six days by various accounts. By the end of the week 34 others had joined her; some by choice, others seemly taken by madness. Even when their shoes were dripping with blood and sweat poured from their bodies, they continued to dance. Even though their families begged them to stop and they were dying of thirst and hunger, they couldn't or wouldn't stop dancing. Within a month around 400 people were dancing and as many as 14 people a-day died of exhaustion, hunger, heart attacks and stroke. The magistrates and physicians tried to halt the dancing by paying musicians to play for the dancers in hopes they would stop when the music stopped. But it didn't work. Instead the music just induced more people to dance. They tried throwing water and sheets on the dancers and restraining them, but they just began dancing again when released. Some were taken to the shrine of St. Vitus where they prayed to the saint to release them from this spell and that seemed to help. Eventually the hysteria wore off leaving dozens dead and many others crippled for life. Choreomania was not new to these parts where it was known by several different names. Outbreaks were recorded as early as the 7th century. In Bernburg, Germany, 18 peasants began singing and madly dancing around a church disturbing the Christmas Eve 1020 service. Because on three separate occasions in the 13th and 14th century, outbreaks of dancing mania began on or near St. Vitus' Day it was called St. Vitus Dance. St Vitus was believed to have rid Emperor Diocletian's son of a demon that made the boy convulse and foam at the mouth so St. Vitus was the patron saint of epileptics and dancers. In 1374 it struck in Aachen, Cologne, Trier and numerous other towns in the Alsace. The unfortunate people who succumbed were described as dancing and leaping until the flesh was worn from their feet and the bone and sinew exposed. The dancers begged people to hit them in their stomachs to drive out the devil. They had to be restrained from dancing in tightly wound sheets. They danced as in a trance and when lucid cried out to St. John the Baptist for help. People called it "St. John's disease." It struck again in 1463 near Trier. In 1560, Peter Brueghel witnessed the torment St. John's disease and documented it in his painting, Dancing Pilgrims at Molenbeek. The women in the picture are contorted in pain and their eyes have the glazed look of a trance state. Others have to support them as they make their way to a sacred shrine to beg St. Vitus for a cure. Some people believe it was a curse for their sins, and others a sacred madness sent by God to bring visions and prophecies. But when people began to die, most thought it another plague like the black plague or smallpox, which was sent by the devil to torment mankind. It served to reinforce their belief that Satan was real and walking among them. They were terrified to think that at any moment the devil could take their body and use it like a puppet, forcing them to dance to their deaths. Worst of all for the people of the Middle Ages was the thought that God had turned His back on the world because of the sinfulness of society and the clergy. Some modern scholars have postulated that ergot poisoning caused choreomania. Ergot is a mold that grows on rye and can lead to hallucinations, epilepsy, gangrene and death. However, this theory has been dismissed since none of the cases of choreomania ever included the characteristic lack of blood supply to the extremities that cause fingers and toes to blacken as if burned that gave ergot poisoning the name St. Anthony's Fire. The most likely explanation is mass hysteria brought on by long exposure to fear and stress. The poor of Strasbourg were also weakened by wave after wave of malnutrition that may have left many people with just enough brain damage to make them open to suggestion and able to fall into an involuntary trance while watching the rhythmic movements of other dancers. The advent of printing made proliferation of the news of dancing plagues, meteors, births of deformed cattle, crop failures, wars, famines, and other disasters spread far beyond the local tavern gossips making everyone who read about these things feel as deeply troubled as if it were happening in their own home town. The blessings of communication brought by the new printing industry unfortunately also lead to wide-spread fear and social unrest and may have done as much to create the Dancing Plague as it did to report it.